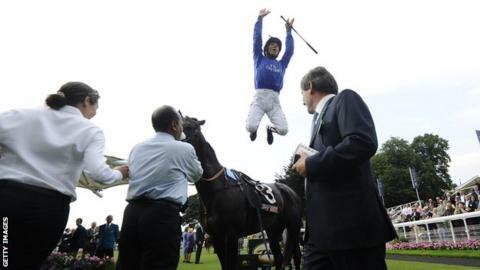 Just when flat racing's Prix de l'Arc de Triomphe was in need of a knight in shining armour, along came Frankie Dettori. Dogged by a string of high profile non-runners, notably last year's winner Danedream, French racing's showpiece event was looking distinctly non-vintage, and in need of rescuing. No one disputes that the presence in the line-up of the charismatic Italian, three-times the winner, adds that much needed gloss. That Dettori is going to complete an uninterrupted quarter century of Arc appearances on no less than dual Derby winner Camelot further enhances the sheen. It also adds another unexpected twist in a dramatic countdown to Longchamp 2012. True, German filly Danedream not being permitted to travel to Paris because of a quarantine order that has shut down the Cologne racecourse, where she's trained, will take some trumping. But the prospect of Dettori donning the silks of Camelot's owners, the Irish-based Coolmore partners, for the first time in seven years is pretty extraordinary too. With regular rider Joseph O'Brien, son of the colt's trainer Aidan O'Brien, unable to make the three-year-old's weight, quite a few names had been the subject of replacement chatter. But not that of Dettori, long a prominent cog in the Godolphin racing operation, run by Sheikh Mohamed, Coolmore's arch rival on the track and in the thoroughbred breeding industry. After taking the 2005 St Leger on Coolmore's Scorpio, the three-time champion jockey had expressed regret and apologised to his boss for any disloyalty and/or embarrassment felt. Subsequently he indicated mounts for the Irish racing empire were, as far as he was concerned, off-limits. The Sheikh himself, apparently irritated by the growing success of his opponents in races that once he dominated, avoided Coolmore stallions and their progeny. For their part, until recently Team Coolmore, headed by John Magnier, shunned the Sheikh's cherished Dubai World Cup fixture in his home state. It's been suggested that Dettori's decision to accept the ride on Camelot signals an improvement in relations between world racing's two superforces. It's unclear, however, if Sheikh Mohammed's permission was sought, and more likely is that the jockey, the winner of hundreds of races for Godolphin over nearly 20 years, feels more of a free agent these days. Under a new arrangement, he shares the stable's top rides with Mickael Barzalona and Silvestre De Sousa, a fact that surely makes seeking rides elsewhere that much easier. As a 41-year-old, and father of five, he may be approaching veteran status, but few doubt he's as good as ever, particularly on big stages like the one at Longchamp. At Coolmore, he was an obvious choice for Camelot not least because Magnier remains an admirer, famously joking after Dettori had said he'd ridden for Coolmore for the final time: "Frankie, we still love you and we forgive you, because you know not what you do." The Prix de l'Arc de Triomphe may be a big day for the jockey, but it is even more significant for Camelot, himself only confirmed a certain runner this week. The reputation of the son of recently-deceased 1999 Arc winner Montjeu had soared with every stride prior to his St Leger defeat, the first of his career, in September. However, when narrowly failing to add the Doncaster Classic to his wins in the 2000 Guineas and Epsom Derby, and so claim Flat racing's Triple Crown, it came to something of a standstill. Victory in the Prix de l'Arc de Triomphe, or even a gallant near-miss, would see it marching on again. And trainer Aidan O'Brien, who also saddles big race fancy St Nicholas Abbey, the mount of his son Joseph, believes it is more than possible, insisting Camelot may be the best he has ever had. Making him an ideal charger, you might think, for any knight in shining armour.